Celebrating World Environment Day 2018. Environment Day at the Library Auditorium of Mongla College and in Mongla Upazilla Headquarter. 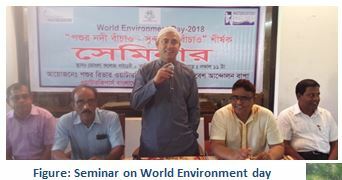 The program was chaired by the Bangladesh Poribesh Andolon (BAPA) Mongla coordinator and Poshur River Wterkeeper Noor Alam Sheikh. At the end of the program awards were distributed between the winners of the competition.